I'm sick. I am completely and totally blaming this on my lifestyle and, as my sister called them, "2-legged walking germ factories". None of the kids was openly sick. They don't have to be. Kids in day care are exposed to hundreds of viruses to which they build up immunities. They bring them home and their parents become immune to these as well. Enter Aunt Debbie. Now Aunt Debbie hasn't gotten a flu shot in 3 years. Why? Aunt Debbie doesn't come in contact with many people. Aunt Debbie works with a very small group of people, all over the age of 25. When Aunt Debbie goes out, it's usually with people her age and to venues where day care assisted germs can't be found. Put Aunt Debbie in a room with little people and all the things they carry and Aunt Debbie is going to catch the first thing that can jump ship onto her. As healthy as I felt last weekend, it's nothing compared to 'little people germs'. I was fine until Thursday. I knew I was coming down with something on Wednesday but thought liberal application of hot tea with honey and a 12-hour sleep would staunch it. HA! I lasted a half-day at work. I stuck it out until someone else came in to answer the phones. 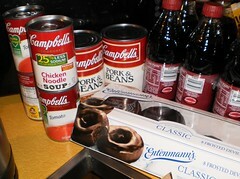 Then I went to Dominicks and stocked up on comfort food. When your head is congested and smelling is something you only dream about, food becomes an item you know you should partake of but nothing is appealing. Therefore, it is in my best interests to have things I will eat, that are appealing, even if they taste like cardboard and have no smell. Soup, both tomato and chicken noodle; beans, to be combined with smoked sausage and heated along with the leftover pork loin from last weekend; chocolate frosted donuts (these didn't make it through 24 hours); and Dr Pepper. Other than the donuts, I've had a can of soup, some toast and a couple of Dr Pepper and lots and lots of tea. I think it's "Feed a cold. Starve a fever", but I'm also quite sure that if you treat a cold, it will be gone in 7 days. If you don't treat it, it will linger for a week. I had nothing in the house to combat the cough, which was so bad on Wednesday night through Thursday, that I bruised my rib muscles coughing. I take a prescription pain medication and the last thing I need, on top of this cold, is to have a drug interaction between something over-the-counter and my pain med. The pharmacist said I was good with any over-the-counter meds and he recommended this stuff, too. "Zicam works," he said. "I feel it lessens the severity of symptoms. I suggest you add it to what you're going to buy. It's not something you're going to get addicted to." So I am in day 2 1/2 of taking this roughly every 3 hours as directed. My cough has, for the most part, gone away, which is very good. The hacking cough of this cold was so painful yesterday with the bruised muscles. I have a lot of drainage down the back of my throat and, right now, my head is stuffy. But, this hasn't made any move to head to my lungs. This is a very good thing. I can't take good old penicillin for infections and the drug I do have to take is expensive. I'm tired, but that's expected with a cold. I don't know if this works or if this is the natural progression of this cold. The stuff was on sale for $10 and it doesn't taste awful. The proof will be how I feel come Monday. In theory, I should "be over" this by Thursday of next week. If I'm feeling 80% or better come Monday, I'll consider this a moderate success. Check back next week to see. Now, off to make more tea.